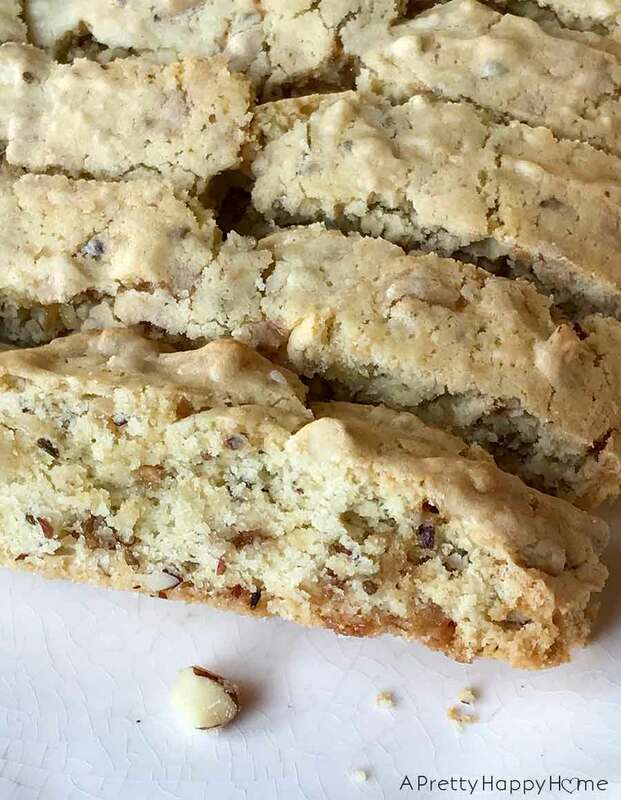 A couple of picture notes about this biscotti recipe…. Here’s an example of how the dough looks dropped onto the cookie sheet. Here’s an example of how the dough looks after the first period of baking and after you’ve sliced it into strips. It will go back into the oven after this to finish baking. Drop dough by spoonfuls onto a greased cookie sheet forming two long strips or smooth log-shapes. You could use parchment paper instead of greasing the cookie sheet. Bake 30 - 35 minutes at 350 degrees. The logs are going to spread out a little during the baking process - this is fine. Let biscotti logs cool slightly and then cut into 3/4 inch slices. Leave on the cookie sheet. If the edge pieces are already "done" to your liking, you can take those off the cookie sheet now, otherwise, they will just get crispier.